I’ve been rejected many times in my life and I still feel I am a valuable person. I know many other people who have been said “no” to by serious and important institutions and companies at different stages in their life. Many of them have done great things and are wonderful people. This post aims to focus on the issue of why TEDx rejects (people who have applied to attend a TEDx and didn’t get in) are important, and makes suggestions about what can be done to improve the current situation. 300 out of every 400 applications was rejected – the TEDx licence was for 100 maximum. TEDxWarsawSalon sent a polite message of regret to those who didn’t get in. I don’t know if four applications for every place is normal, but even if one person is rejected, TED has an issue. I discussed with the organisers my idea that more could be done, and here are my reflections. The question is, whether it matters and whose job it is. Within TEDx-es there is an issue of priorities. It is quite understandable that someone who has taken on the challenge of organising an event decides to put all their efforts into making the event good for the people who are going to be there. I am arguing that the issue of “TEDx rejects” matters. 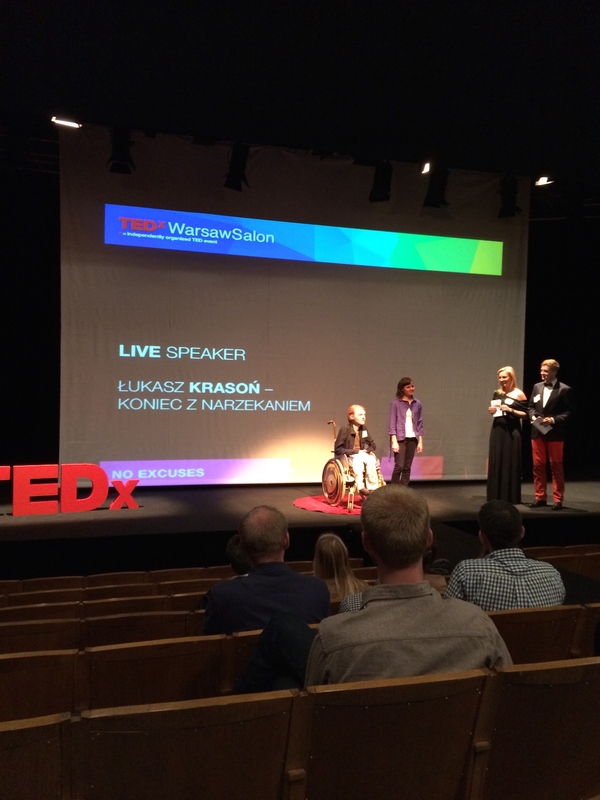 I was one of the lucky 100 who got in to TEDxWarsaw Salon, but there were another 300 who tried and were rejected. When I went to another excellent TEDxWarsawSalon in 2013 I remember meeting someone who told me – “I’ve tried to get in twice before – at last I’ve been accepted. ” I’ve met people who have a negative feeling about TED and TEDx as being elitist and exclusive because their only interaction with TEDx is failing to get a ticket to an event. Because I’ve been to so many events (four TEDxKrakow, +/-ten TEDx Cinemas (about), Three TEDxWarsaws, Two TEDxWarsaw Salons, one TEDxWrocław Salon, Two TEDGlobals, Two TEDxKrakowLives. one TEDxKrakowCity.2.0) I know that TEDx-ers are not exclusive or elitist., but if you don’t get in you don’t know. When Unilever, McKinsey and many other employers said no to me when I was job hunting back in the 1980s they always sent a nice letter saying “you made a great impression, while we were impressed you didn’t quite meet our requriements good luck with your job search”. If a company doesn’t want to employ someone, or an event is full, such rejection is inevitable. In the case of TEDx-es – there is something going wrong if anyone feels completely rejected. The main idea of TED and TEDx – is that there are “ideas worth spreading” for free – Ideas cannot and should not reject people and therefore TED and TEDx-ers should not let people feel rejected either. So how can TED and TEDxs address this? TEDx s and TED conferences are limited either by space or licence – (TEDx- licences have limits on the numbers who can attend). On line sharing of ideas – which is how the majority of people interact and hear about TED is obviously not limited by space. Facebook, Instagram and Snapchat are never “full”. As TEDster Clay Shirky argues in his book “Here Comes Everybody” thanks to the internet people can create, engage and be part of communities without being part of a local structure – meaning that it is not just possible but in the case of TED quite likely that people who have a close emotional connection with TED feel positively hurt and upset when they are not welcomed with open arms even if the reasons are good. It is understandable that the organisers of TEDx-s don’t feel this problem in the same way the rejects do. As Nobel Prize winner Daniel Kahneman wrote in ‘Thinking, Fast and Slow’ our rationality is limited by ‘availability”. If you don’t have the rejected person in front of you, you won’t think about him or her very much. 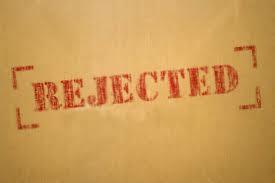 Having been rejected in various contexts I am acutely aware of how it feels. TEDx-ers with licences, know how it feels to have a licence, and meet and interact with people who they have accepted. Thinking about the rejects is possibly unpleasant. At one level it is possible that it feels “high status”and cool to curate an event that is so popular that people cannot get in. However, the reasons that events are so over-subscribed is partially because of the power of the TED brand. Handling the over-subscription/reject issue well should be regarded as a challenge and responsibility. There must be millions of people who would love to come to TEDxes but who cannot due to their location, job , financial situation, relationships, domestic responsibilities or even disability. It’s natural to focus on the people who come. but the online invisible community is also out there. For every Daria Musk who escaped from her remote location, and became a star thanks to Google Hangouts, there are for sure many other valuable people who may never be able to engage with TED or TEDx face to face at an event . My proposal is for TED to insist on having a high quality rejection process. It doesn’t cost time – just an improved rejection letter, and I’ve drafted it already to make it even easier. Below is my draft to deal with people who are not accepted for a TEDx. The process of being rejected for a TEDx Licence, a TED Summit, as a potential volunteer or Team member would be a bit different. The numbers are much lower, and the reasons may be good. I am sure the letter can be improved, and modified to local circumstances. – for example the links could be to local webpages. The one below is by way of an example. You can sign up on TED.com web site and take part in on line discussions in the comment thread below each talk. Go here and search in your local area to see if there are TED fans in your town or village you know or can make contact with. You can visit the TEDx subpage on TED.com to find other TEDx s in your area. Maybe you can volunteer to get involved in their existing activities. Search on Facebook, Twitter, Linkedin, Couchsurfing, Google groups, and your local national social media portals to see if there are TEDx groups there. Maybe you can get involved in local events, on and off line discussions and/or meet ups. In Poland there is a TED and TEDx Fans in Poland group Maybe you can set one up, or offer to run such a group for your local TEDx. You can appoint yourself a TED Social Media Ninja and post links TED talks you love that are relevant in on line forums you belong to. Could you apply to be a TED Fellow? Check this out Anyone can apply. If you are a teacher or trainer, you can sign up for TED-ED and learn how to turn videos into educational content. In Kraków Poland TED talks were part of this event. In Warsaw I organised an “Pre TEDx Warsaw meetup” as part of TEDsurfing – the TED and TEDx Travel and meetup club At Penn State there were TED talk and a pizza discussion meetings. The people who come might be potential team members to do your own TEDx. You can organise an information meeting about TED and TEDx in your place of work or study showing talks about TED like June Cohen’s here The statistics are a bit out of date but the TED is even more popular now than it was back then. Showing such talks is a great idea if you are considering applying for a licence. If you show this talk that must be played at every TEDx then you just might end up forming a group to apply to do your own TEDx!! We appreciate that watching a video telling you how great it is being at a TEDx is may be a bit frustrating, given you haven’t got a place to ours. In the startup community there is a commonplace idea that failure is good, or at least useful. “fail fast ‘ ‘failure is a valuable learning experience’ ‘The problem with Europe is that we don’t accept failure’. JK Rowling in her brilliant and moving Harvard commencement address even goes so far as to say ” It is impossible to live without failing at something, unless you live so cautiously that you might as well not have lived at all”. Even if you are very disappointed we hope you won’t give up. We are not happy that we don’t have a place for you. Please don’t think of yourself as rejected. 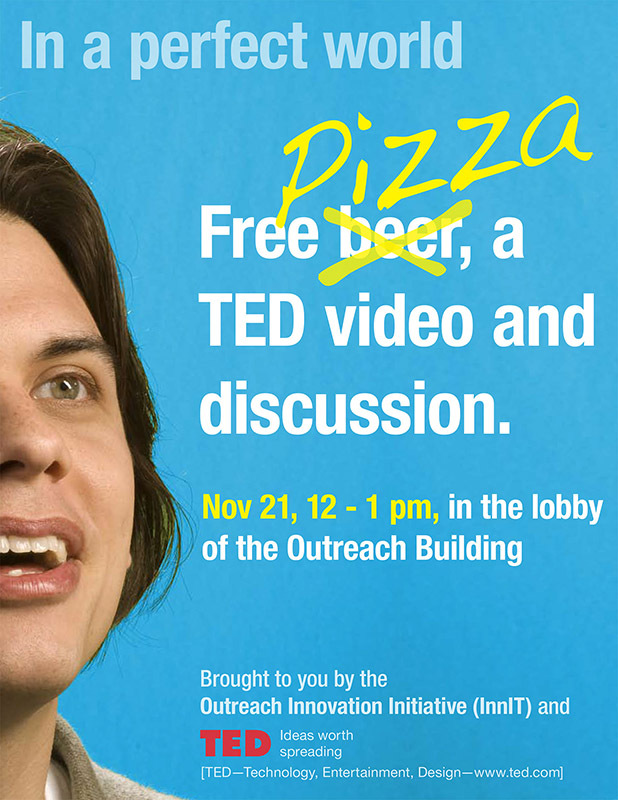 We hope to meet you another time and to find a way in which we can work together for the ideals of TED and TEDx. a global voluntary conversation about ideas worth spreading. curator or a named team member. As an experiment I’ve set up a Facebook Group called the TED and TEDx fans, TEDx attendees and TEDx would be attendees group Please feel free to join. Part of what makes it special to attend these conferences in-person is that the audience is curated. For instance, my TEDxFultonStreet event in New York City is primarily by innovators in Technology, Entertainment, Design, Education, and Entrepreneurship. We get many applications from people whose job description is that they’re seeking to sell things to these individuals, and we try hard to politely screen those out. I think it’s pretty generous of Chris Anderson to allow individuals to represent the TED brand without ever having been to the actual conference… and reasonable to place a 100-attendee limit on events where none of the organizers have actually had ‘the real experience’. It’s not that difficult for an organizer to get a ticket to TEDActive, and then upgrade to a large-event license. It’s also FREE for any TEDx organizer to broadcast their event via Livestream.com to an audience of infinite size. It’s the organizer’s right to be selective about audience members – but if there are truly 400 leaders who wish to attend a 100-person event each year, then perhaps they should rally and encourage one of the event organizers to actually attend the main conference. All that said, I do agree with you that rejections should be polite. What does your rejection letter look like ? Thanks. We ran our event as “invitation-only”, and did not reject anyone who was personally invited by one of our senior organizers. Then, we partnered with several universities, clubs, and affiliates, which already pre-screen their membership. There was a handful of people who “invited themselves” by filling out a lengthy application online, and almost all of those were accepted. There were only a few who we felt a need to “reject”, and we courteously suggested that they watch the event via Livestream (which is free for everyone), and apply again the following year. We tried not to be critical of applications, to avoid hurting anyone’s feelings, but in general we rejected those who had absolutely nothing to say when we asked questions like “what is the creation of yours, not counting family, that brings you the most pride?” or “how do you feel your presence would enhance the event experience for other attendees?”.